To Cite: Khatiban M, Oshvandi K, Borzou S R, Moayed M S. Outcomes of Applying Neuman System Theory in Intensive Care Units: A Systematic Review, Crit Care Nurs J. 2016 ; 9(4):e8886. doi: 10.17795/ccn-8886. Background: Applying theories in clinical practices is an important factor in development of nursing science and reduction of the gap between theory and practice. The aim of this study is to assess outcomes of applying Neuman system theory in intensive care units. 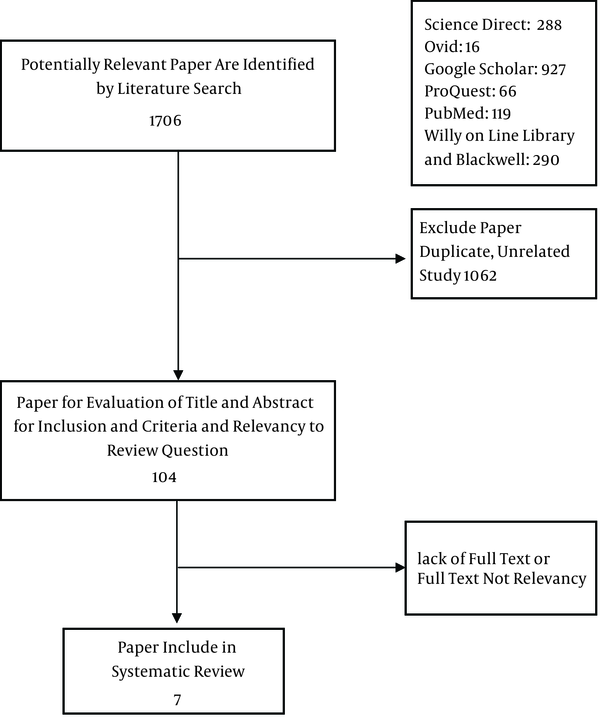 Methods: A review study was conducted in 2016 through searching on Cochrane Library, Science Direct, Ovid, Google scholar, PubMed, Wiley, ProQuest, and Blackwell databases. The search was performed by using ICU, critical care, defense line, client system, nursing, and neuman system model as key words. Finally, 7 articles in English were assessed in this study, comprised of 5 quantitative studies, 1 qualitative study, and 1 case report study. Results: Outcomes of applying the theory were assessed in three categories including: 1. Caregivers (nurses), 2. Care receivers (patients and their families) and, 3. Intensive care unit environment. Regarding nurses, the results indicated an improvement in supporting of nurses, creating a social network in the workplace, and preventing post-traumatic disorder by using three prevention levels. Regarding patients and their families, identifying environmental stressors and controlling them resulted in high quality care and by using evidence-based care, it led to the prevention of delirium. Family was found to have an important role in terms of the created environment and acceleration in patients’ improvement; regarding factors related to the unit, creating a relaxing environment by playing music resulted in stress reduction. Conclusions: Correct evaluation of the elements of treatment process leads to identify different kinds of stressors in nurses, patients, clients’ families, and intensive care unit environment as well as providing appropriate strategies which can cause stress reduction and subsequently satisfactory treatment outcomes. Achieved knowledge and awareness may lead to new studies for combining theory with clinical practice. This new knowledge can provide dynamic and scientific care. Development and application of nursing theories are very important in directing nurses’ performance, health system, and development of nursing science. Mostly, development of theories due to being abstract is not simply possible to be applied at clinical practices; it is while directing nurses’ performance and controlling clinical environment based on the theories and nursing models can be one of the important ways of developing professionalism and independence in nursing (1). In addition, the theories may lead to more effective and complete nursing clinical performance (2). Nursing is one of the occupations that are associated with high levels of stress and anxiety and nurses are one of the groups that experience the highest level of job stress (3). Intensive care units provide specialty and subspecialty cares; these units are stressful areas both for patients and nurses. Nurses have to respond high psychological and physical demands of the patients, which potentially influences their health (4). Among stressful factors of intensive care units, it can be pointed out to working relationship with other nurses and healthcare staff, communication with relatives and patients, high level of required knowledge and skill for working in this unit, heavy workload, necessity of quick respond to urgent situations, and the heavy responsibility of taking care of the patient (5). On the other hand, improvement and progress of health care technologies and specialized cares has created some new stresses emerged in intensive care units, so that these stresses have an influence on patients, their families, and caregivers’ health (6). Such work environment finally decreases nurses’ emotional and psychological resources and is a start for burnout syndrome; this syndrome results in a sharp drop of health care quality through creating a negative self-image, negative attitude toward the job, and lack of desire for communicating with clients when he / she is providing care. A conducted study showed that the highest level of stress relates to taking care of the patient and managing its outcomes (5). There are many methods for managing stress in terms of nursing, one of these methods is called NSM (Neuman system model); this model emphasizes environmental stressors and responding to them. This theory has been developed as a comprehensive training model and a framework for organizing nursing knowledge since 1970 (1). Exclusive focus of this model is on the client’s wellbeing / client’s system regarding environmental stress and reaction to stress (7). Client/client system can be a person, a group, a family, or a society that consists of internal and external features; in some cases it behaves as a subject that is undergoing stress and sometimes as a protective factor (8). NSM is an open model, which considers appropriate performance in a stressful situation or at the time of a patient’ potential response as the nursing priority (7) and introduces a client as a stable interacting system along with intra-, inter- and/or extra- personal stressors. The available stressors in the environment are able to attack a client’s natural defense line, unless the client is protected by a flexible defense line (1, 9, 10). In case of weak flexible defense line, normal defense layer is involved and responds to the stressors. At this time, resistance lines are activated and enter into the action to prevent acute health problem in the central core structure. Resistant lines are a combination of five physiological, psychological, social, developmental, and spiritual variables; the difference between them is that more stable variables tend to last more permanently (1). In addition, Neuman introduces prevention as one of the important nursing actions for protecting a client. The aim of nursing in this model is strengthening defense and resistance line of the client, improving his/her health and finally, his/her coping ability (6, 7). What are the outcomes of applying Neuman system theory in intensive care units? 1. Papers written in English. 2. Studies carried out through experimental, quasi-experimental, and qualitative methods. 3. Studies focusing on samples including nurses, patients (care receivers and clients), and clients’ families by providing care and/or intervention performed according to Betty Neuman Systematic theory. 4. Papers published up to 2016. 5. Papers with available full text. 6. Studies capable to respond the questions of the present research. Initially, 1706 available texts were entered into EndNote software; they were assessed and 1602 cases were removed due to being repetitive, being book or unrelated to the study subject. Then, the remaining 104 texts were further studied and another 97 were removed. Finally, 7 articles included in the systematic review. In the final stage, to prevent lose of papers, it was tried to consider relevant texts in the assessment list by using references cited by the selected papers, but no study met the criteria. The diagram of study selection can be observed in Figure 1. Accepted papers were first summarized after being reviewed separately by two researchers and then their full text was retrieved. These papers were evaluated in terms of their methodology. JBI-MAStARI (The JBI meta-analysis of statistics, assessment and review instrument) was used as the tool for assessing quantitative studies (this was employed to assess studies in terms of cognitive method). This tool included 10 criteria; the studies providing at least 6 criteria included in the study to be assessed. Data achieved from these studies can be observed in Table 1. What are the outcomes of applying Neuman system theory on Intensive care Unit (physical conditions)? What are the outcomes of applying Neuman system theory on nurses and health care providers of intensive care unit? What are the outcomes of applying Neuman system theory on patients’ family and clients of intensive care unit? 4.1. What are the Outcomes of Applying Neuman System Theory on the Intensive Care Unit (Physical Conditions)? This theory considers the surrounding environment and the necessity of assessing the environment and its effects on increasing and decreasing stressful factors. This consideration can result in identifying stressful factors in order to remove them in an appropriate way. Factors such as increased light, ambient noise, heat, loneliness are recognized as physical stressors; controlling these stressors can lead to improvement of unit care conditions and finally decrease in environmental complications. Identifying and providing appropriate effective environmental stimuli (like playing favorite music) can decrease perceived stress and the pain related to therapeutic actions and internal stressors (11); In addition, it provides an appropriate tool for exact evaluation of the patients’ stressors and perceiving their requirements (12). A. Appropriate evaluation including being aware of all the factors influencing patient’s perception. B. Concept of stressors should be perceived by both the clients and nurses; deviations should be clarified to have appropriate nursing performance (13). Considering inability of most patients hospitalized in intensive care units, provided tools based on the Neuman theory can focus on the patients’ family. Such tool can include three parts of primary, secondary, and tertiary intervention, which finally led to requirements that have to be followed by the unit (12). 4.2. What Are the Effects of Applying Neuman System Theory on Nurses and Health Care Providers of the Intensive Care Unit? Intensive care unit encounters nurses with different kinds of stressors, which can result in nurses’ psychological traumas; one of these disorders is PTSD (post traumatic stress disorder). Three roles are considered for the nurses in traumatic incidents; they can be as the observer of the incident, the victim, and finally they may suffer from the stress related to background (14). Nurses are suffering from high pressure due to large number of patients and high work load; they are also under high pressure by the patients’ family and relatives. Applying Neuman systematic theory by using three levels of prevention is very effective in reducing injuries in nurses. These actions are divided into two organizational and individual levels. Regarding the organizational level, a cooperative supportive system, educational and simulated emergency situations can be effective in decreasing injuries. Regarding the individual level, increasing nursing knowledge about stressful factors and factors influencing the increase of flexibility and endurance, as well as strengthening the ability of coping with stressful factors are among other outcomes of applying Neuman theory on nurses (15). Applying Neuman systematic model can result in decreased psychological injuries in nurses. 4.3. What Are the Outcomes of Applying Neuman Systematic Theory for Patients and Their Family? 1. Considering differences in assessing requirements: necessary understanding of the nurses to compare the difference of the stressors perceived by the nurses with those perceived by the patients’ families in intensive care units under critical conditions. 2. Nurses’ ability to develop accurate knowledge about stressful factors in the patients’ family since family partnership is very important in the treatment process. 3. Nurse’s inability to identify stressful factors in the patients’ family that can lead to the worsening of patient and family conditions. 4. Patients’ needs cannot be separated from their family needs; patients and their family should be considered as a client system. 5. This theory makes a framework for helping nurses control critical conditions and work with families. 6. According to this theory, nurse’s role is to create appropriate strategies for families to cope with stressful factors (17). 7. Changing in the family members’ role or losing one member of the family in intensive care units are among the stressful conditions for the patients’ family (17). 8. Patients’ family is considered as a member of the health care team. 9. Nurses’ cooperation with the patients’ family results in a strong defense wall and reduced recovery duration after intensive and critical conditions. 10. Using this model in the cooperative care of nurses and families reduces the length of hospitalization in ICU significantly. 11. Using evidence-based care according to Neuman theory can decrease delirium in patients of intensive care units (18). 12. Nurses’ understanding of the stressful factors and conditions can have a great influence on setting-up care plan which can lead to high quality care (6). Neuman systematic model is one of the most applicable and popular nursing models in USA. Numerous papers and researches have indicated the validity of the model. Clients’ stability and providing preventive interventions led to the generation of several middle theories derived from this theory; clarity and simplicity of this model made it generalized and extended (19). From the results of this systematic review on groups affected by Neuman systematic theory, it can be concluded that Betty Neuman model is one of the most applicable models for controlling stressful conditions in therapeutic units, supporting nurses, improving patients’ care, increasing ability, and decreasing families’ stress. The results of this systematic review on studies based on Neuman system theory in intensive care units were summarized in three categories. Results achieved from this study indicate that nurses of Intensive care unit are exposed to all the stressful factors provided in the Neuman model; providing strategies in three levels of prevention can be effective in decreasing effects of stress on nurses and reducing their physical and psychological complications. On the other hand, nurses of ICU are experiencing high workload that influences their health, immunity, quality of life, and care providing capability (20). Studies have shown that fatigue due to chronic stress resulted from responsibilities of nurses, modern technologies, and dealing with critically ill patients can indirectly affect the level of hospital infection (21). The conducted study showed that this model provides a systematic method for assessing nurses’ stressors and therefore it can decrease complications and their severity through appropriate support of social networks in intensive care units, good interpersonal relationships, using counterparts, and providing a safe environment far from stressors (8). In addition, nurses’ perception of patients’ stressors can be very helpful in making decision and identifying better care requirements (6). Nurses working in intensive care units are one of the key members and responsible groups in treatment; therefore, they should be able to explain care outcomes and reasons of every action based on scientific reasoning; and in the case of doing an action without any scientific basis, the nurses can be questioned. The use of nursing model and proper adjustment will make a framework through which all the nurses can design and provide a logical care for patients; this process facilitates communication among nurses and integrates various aspects of care and prioritizes them (12). Intensive care unit is a stress-inducing environment with high mortality and disability rate and daily clashes (22). Intensive care unit environment has an important role in controlling disease and treating patients. The study of Kelly Costa showed that environmental features of ICU affect the incidence of pneumonia due to ventilator (23). On the other hand, some limitations such as time limitation in intensive care units are considered as stressful factors since there is a steady stream of life-threatening events and unstable conditions and a large number of actions that need to be recorded. One of the limiting factors of applying nursing process is a daunting prospect of broad and comprehensive care programs, which cannot be applied under unstable conditions of Intensive Care Units. In this context, NSM makes the programs in Intensive units applicable by providing appropriate tools for accurate assessment and evaluation of the patients and providing appropriate procedures (12). Another issue, which is important in applying nursing models, is communication status of hospitalized patients in these units. Communication of patients in intensive care units is limited due to the lack of full consciousness or taking relaxant and sleeping drugs. Therefore, under such conditions, a model is applicable that considers patient’s family as one of the main pillars and involves patients’ family in making decision about patients’ care process. Usually in such situations, patients’ physical condition is in a higher degree of priority compared to the psychological condition. Therefore, the suggested model needs to be flexible; in addition, this model should cover patients’ various problems (12). Another important group impressed by the model, which has been already discussed, is patients hospitalized in intensive care units. These patients are encountered with several physical (such as pain, restriction of movement, thirst, hunger, suctioning, etc.) and psychological problems (losing time, delirium, etc. ), which are considered as inter-personal stressors. Inability to communicate with the medical team and with other people is another source of interpersonal stressors. Also, they suffer from problems related to environmental stresses such as sleep disruption, noise, and lack of privacy; this model could reduce these problems through providing strategies (10). As stated earlier, the meaning of family is very important in Betty Neuman’s point of view; Neuman model considers family as the center for care in a family-centered approach. Wright and Leahey stated that despite the importance of family role in care procedure, it is usually ignored in studies. It is necessary for the nurses to try to make families’ dynamism connected to health and disease. However, considering the development of individualistic culture in nowadays communities, it is necessary to appreciate families’ dynamism for the situation of hospitalized patients (16). As it is necessary in children nursing to consider the child as a member of the family, Neuman model with regard to providing care of the family has suggested the term “family systems nursing”. This term considers all the family as the care unit; although every single member of the family is individually important, they have not been seen alone (24). Kosco and O’Malley have emphasized the importance of nurses’ understanding and identifying requirements of the families of the patients hospitalized in Intensive Care Units in their studies; they believe that experience of the nurses working in these units and also level of education are important in the level of their identification (25, 26). Results of this study indicate that although NSM was initially developed to be an educational model, the focus of this model on patients responding to environmental stresses changed this model to a research model rapidly. Applying this model to collect data and identify different kinds of stressors in nurses leads to improvement of care process, appropriate understanding of patients’ stresses and finally, providing appropriate care. Providing family-centered care based on the three prevention levels, identifying and accepting inter-personal, intra-personal and environmental problems are very important regarding patients and their families. Also, in assessing environment of intensive care units based on theories in order to identify and provide appropriate strategies, family-centered care can be effective in creating and maintaining patients’ comfort. Knowledge achieved from integration of theory and clinical practices can be effective in increased quality of care and can result in a dynamic and scientific care. Finally, progress and change happen when the nurses are involved in professional cares. Thus, it is essential to evaluate and update the application of models to ensure that the main concepts of the model are congruent with the current nursing philosophy and action. 2 Black P, 2011, North Irland (27) The effect of nurse-facilitated family participation in the psychological care of the critically ill patient A comparative time-series design was used. A total of 170 critically ill patients and families participated in the study-there were 83 in the control group and 87 in the intervention group. Data were collected during critical illness and subsequent recovery using the Therapeutic Intervention Scoring System-28, Intensive Care Delirium Screening Checklist, and the Sickness Impact Profile. The study was carried out in Northern Ireland, data collection took place from January 2004 to December 2005 Nurse-facilitated family participation in psychological care did not significantly reduce the incidence of delirium among patients in critical care, but patients receiving intervention demonstrated better psychological recovery and wellbeing than the control group at 4, 8 and 12 weeks after admission to critical care. 3 Nichols PR, 2000, USA (11) The Effects of Music on Pain and Anxiety During Intravenous Insertion in the Emergency 4Department A convenience sample of 41 subjects completed pain and anxiety visual analogue scales as well as blood pressure and pulse monitoring before and after IV insertion. Twenty-one of those subjects received music during the intervention. An analysis of covariance was performed for post-procedure pain, anxiety, pulse, and blood pressure. Anxiety difference was significant (F = 10.39; P = 0.003) in post-procedure analysis between groups. A paired t-test demonstrated significant improvement within the intervention group in pain (t =2.742; df = 20; P = 0.013) and anxiety (t = 3.049; df = 20; P = 0.006). in addition, diastolic blood pressure was trending with P = 0.059. 7 Ste’phan Lavoie, 2011, Quebec (8) Post-traumatic stress disorder symptoms among emergency nurses: their perspective and a ‘tailor-made’ solution This qualitative study was carried out among twelve emergency room nurses from January to May 2007. Semi-structured interviews and a focus group were designated. Content analysis fulﬁlled the objectives of the research. The frequency of traumatic events leading to contextual exposure and exposure as a witness increases with years of experience (r = 0Æ67 and r = 0Æ57). The frequency of post-traumatic stress disorder symptoms decreases with age(r = 0Æ83). The data demonstrate the importance of having a supportive social network and being able to talk things over with colleagues. The support activities include all types of prevention. They consist primarily of a peer support system, psycho-education and emergency room simulations.